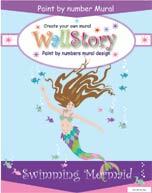 Wallstory murals latest mural design was inspired by a little girl, Sarah, who just couldn’t find the kind of mermaid she wanted for her mermaid themed bathroom wall. Sarah wanted a mermaid with long floaty hair and a happy face that looked like her. Her mum sent me a photo of her which I used as a model for the mermaids face. The space they had available was long and narrow, so the proportions of the mermaid were designed to fit the area. We included lots of extra fish and bubbles that could be used higher up the wall to fill the space, as well as around the room. 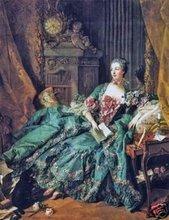 She measures approximately 3 foot wide x 5 foot high. She will be available soon on our Wallstory and our Magic Mural Factory website. 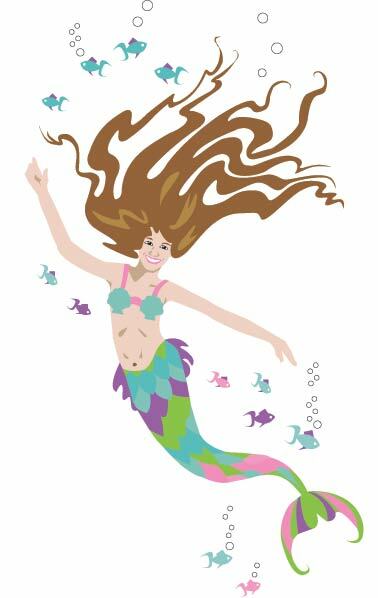 Sarah plans to substitute some of the recommended paint colors for the metalic colors that she loves, to create a shimmering effect on the mermaids tail and bikini. Custom paint by number mural design service for a mural designed exactly to your requirements. If you’re looking for a mural design for your child’s room, then take a look at our paint by number mural designs that you paint yourself. The designs are so easy, it’s just like colouring in a colouring book. If you can’t find the design or theme you want to paint in your child’s room , why not consider a custom designed paint by number mural that you can paint yourself saving loads of money on hiring a professional mural artist to paint it for you. Our custom designed murals are surprisingly inexpensive. The reason is because after we design and produce the mural to your specifications and needs, we get to add the design to our collection on our website. For that reason, we keep the design costs to a minimum. Take a look at our designs and if you can’t find what you’re looking for contact us for a FREE quote and advice with no obligation! Not everyone wants to paint a mural themselves. 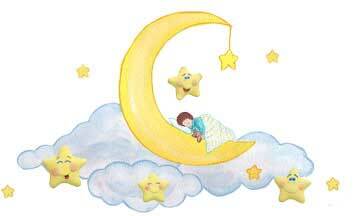 If that’s you, then this mural solution for a baby nursery mural is a great idea for you. Even if you don’t copy the mural exactly, you can use the same technique on another sticker mural you might prefer to use. At the Magic Mural Factory we have more sticker murals, and more themes in the Wallables range of 3d stick on musical wall art. 1) Stick your mural in a postition that your baby can reach. Next to the cot or crib is a good place or next to your changing area so your baby can press the musical stars as you change his nappy. 2) Place the easy stick stars around the mural in positions that your child can reach. There’s always something in the house that needs to be fixed, decorated, plastered, rip out, tidied, but it just seems like too big a job on your own. Top tip – A couple of friends of mine and I have come up with an idea to get a bit of work done around our houses. Rather than battle away slowly on a job or not even start the job, we get together and tackle the job as a team. It was my turn first. I have a room in my house destined to become my Wallstory Murals office. The walls were in a terrible condition, and needed to be replastered. A big job to do on my own. The girls came in and within less than a day we had replastered the walls in a rough textured effect. (I’m going for a rustic look as we don’t quite have those finer skills in plastering) It looks wonderful. Next it’s Louisa’s turn. She is turning a small outhouse she has into her furniture painting workshop. We have a floor to lay there, and between the three of us we should be able to lay it in a day. So here’s my tip for the day. Get together with a small group of close friends and agree to help each other out with jobs you can’t face tackling on your own. It could be anything. Decorating your child’s room, clearing a patch of garden, tidying out a garage, clearing a mountain of ironing. Whatever the job is, a team of friends can make light work of it. It’s fun too because you have to stop for lunch and a glass of wine! Store your paint tins upside down (make sure the lid is on properly).The hard skin will form on the top of paint, and then when you turn it over, the skin will be at the bottom and you can use your paint easily over and over again. The response wasn’t exactly overwhelming as a result of these ‘strings attached’, but I have chosen a winner with a great blog and if she accepts the challenge, we will be watching her progress on her blog posts. I love this kind of thing because I hate cleaning up! When you need to use a paint tray for painting large areas of a room or children’s mural, place the tray inside a plastic bag and pour the paint into the tray as normal. The bag will take the shape of the tray, and when you are finished, simply remove the bag and throw it away. Your tray will be as clean as when you bought it, and you don’t have to wash it up!